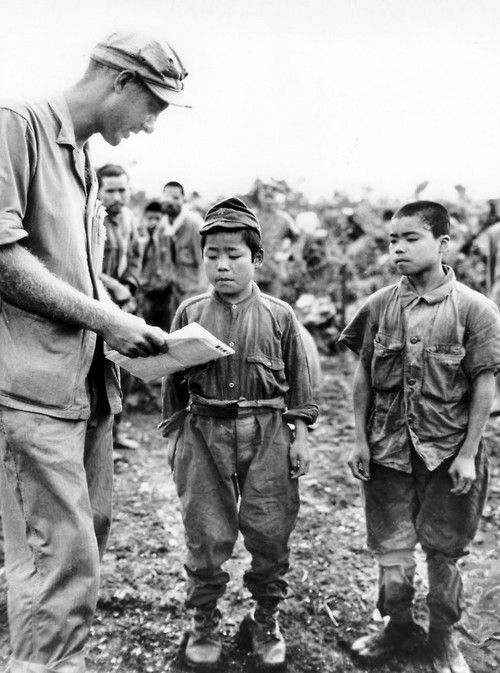 In more ways than one, World War II was the war of the children. 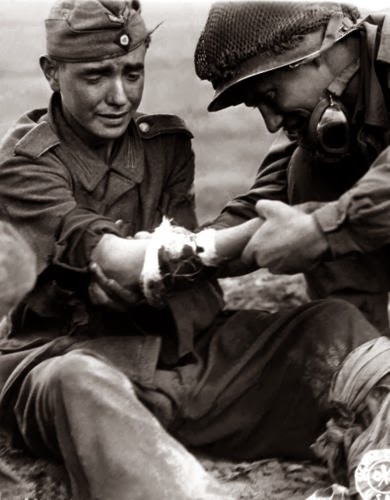 You may not have been told this, but children fought and died on both sides. They started out cheering and wound up dying. That's not an exaggeration, that's reality. Two young German soldiers armed with Panzerfausts (anti-tank weapons) and Mauser rifles, march along Bankowa street in Lubań (Lauban), Lower Silesia. There was fierce fighting there and it was the site of pretty much the last successful German operation of the war. 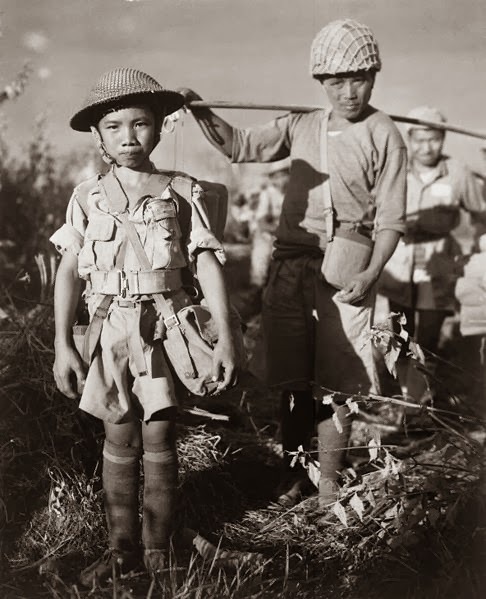 Children suffered on the home front along with adults during bombings and ground attacks, but they also did some attacking and defending of their own at the front lines. Unknown young German anti-aircraft gunner 'flakhelfer' on position with a projectile antiaircraft gun 8.8 cm FlaK 18/41 in the German city of Hagen (Hagen). Countless American bombers were shot down by boys like this. These brave boys were out there in the open while the bombs were dropping around them. Did any of these boys die doing that? Yes. 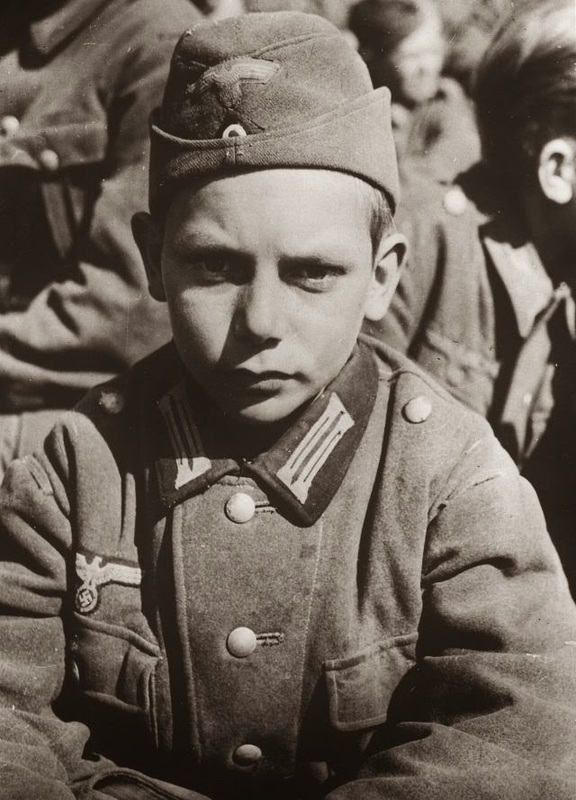 German children were actively recruited for various defense purposes throughout the war, not just at the very end. 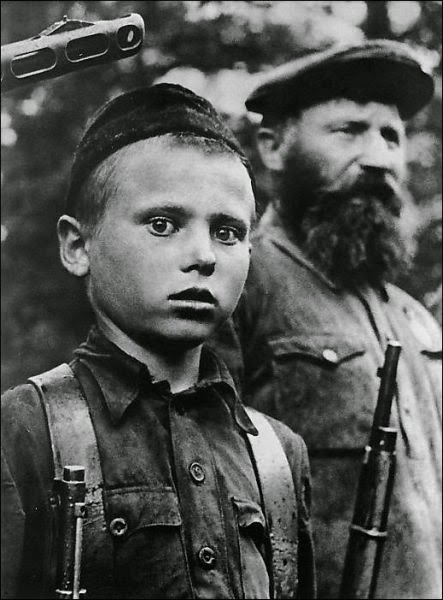 The boys, indoctrinated in the system from birth (or, as the poster above shows, at least from the age of 10), were more than willing in many cases. US Staff Sergeant Francis Daggertt of the Military Police of the 11th Armored Division with a young Wehrmacht soldier. 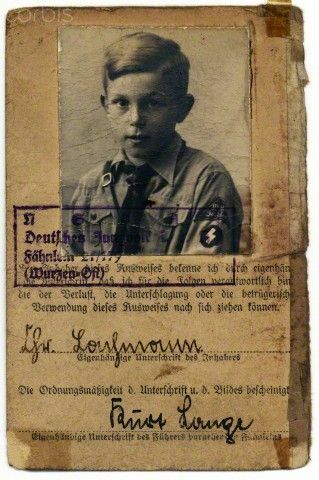 The German was only 10 years old when captured in the German city of Kronach on April 27, 1945. 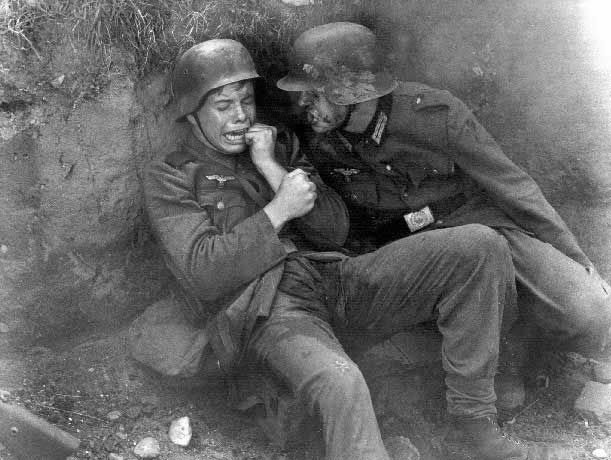 Just having such boys in the war zone exposed them to artillery fire and bombing, let alone the other risks of combat, Many such boys were anonymous, buried without fanfare, forgotten among the millions of dead (colorized). Kids are full of feelings of invulnerability and the desire to prove their worth and abilities. That's what gets them killed. This boy looks remarkably like the one in the above poster. It was the norm for German schoolchildren to wind up working alongside their schoolmasters (often WWI Vets) on anti-aircraft duty or guarding important installations. Not all of the jobs were dangerous, but some were very important. The culture of the time on both sides encouraged a martial indoctrination. The war served as a king of the extracurricular learning experience. 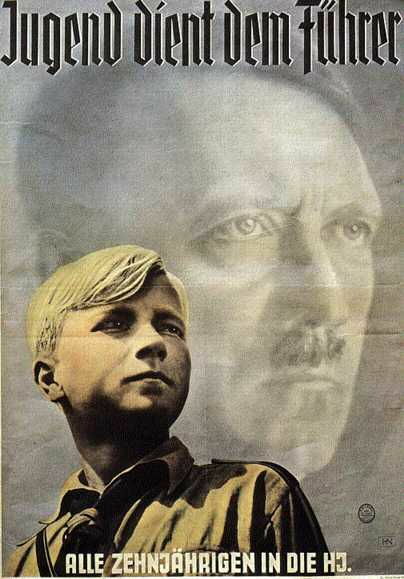 It is not exaggerating to say that the entire Third Reich culture conspired against young boys. 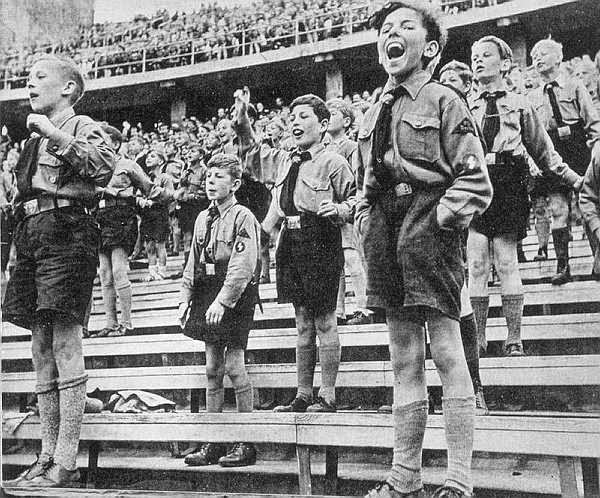 Did the Third Reich give these boys exactly what they wanted, a chance to act savagely with praise from parents and onlookers? Sure. It also gave them ample opportunity to die doing it. 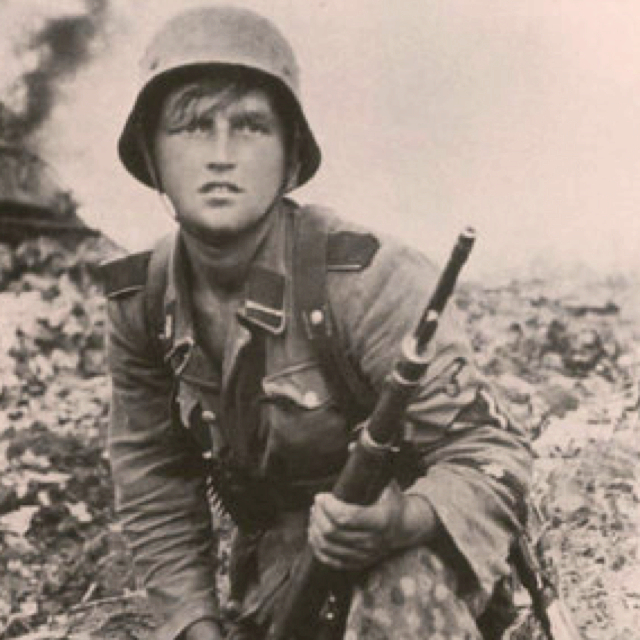 3.SS Panzer Division 'Totenkopf', Warsaw 1944. Surviving the war if you were in your late teens was a major accomplishment. At that age, it is difficult to question those who are older and who stand as the leaders of your people. 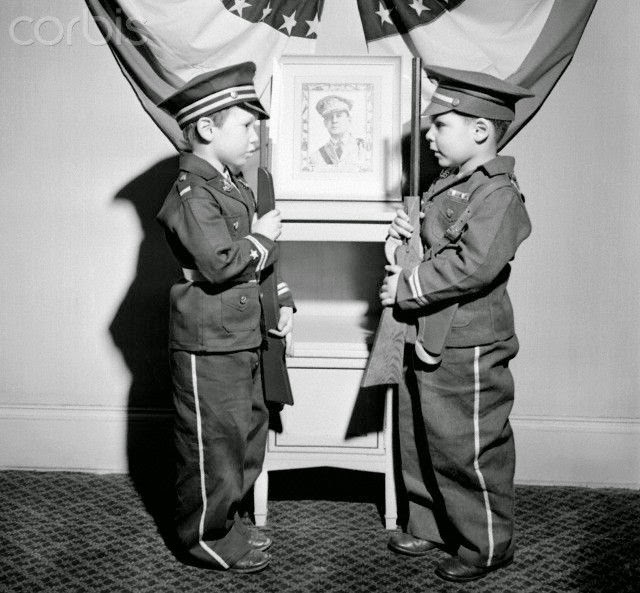 20 March 1945: Adolf Hitler decorates his last tranche of boy soldiers for fighting to the bitter end. Artur Axmann, leader of Hitler Youth, is behind Hitler; Otto Günsche is in the background on left, then Hermann Fegelein in the center and Heinz Linge on the right. Many accounts mistakenly state this was taken 20 April. Without the experience to make your own assessments as to the validity of a cause or to challenge authority, the tendency is to follow it blindly and whole-heartedly. This tendency to conform to what is asked of you, regardless of deeper issues such as morality, survivability or long-term sustainability, is enhanced by the respect given by all to senior soldiers with shiny medals and lots of gold braids; there is nothing a schoolchild wants more than earned respect. Added to that is the very real understanding that by, for instance, manning a Flak gun, you were defending not only your homeland but the lives of everyone you loved. Propaganda encouraged the young warriors every step of the way. Books telling the tales of heroic exploits by soldiers were the norm, but nobody in the books mentioned that they were complete fiction aside from the names and outcomes. 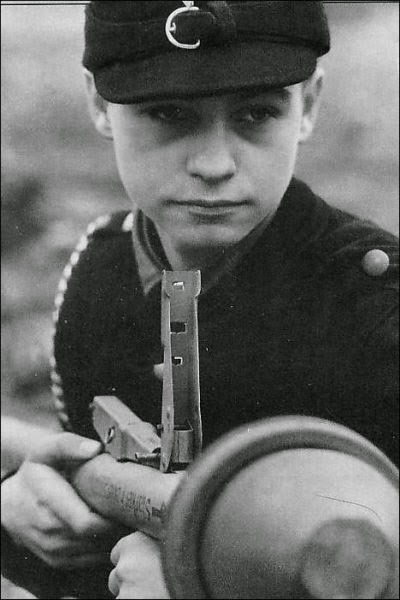 Thus, the youngest soldiers were often the most fanatical, and also the ones who were most determined not to give up. 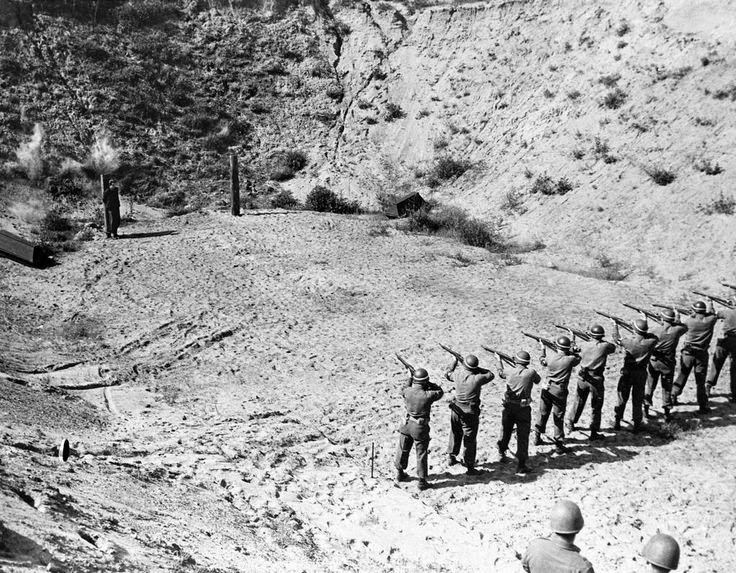 The smart German boys, of course, recognized the self-abnegation resulting from their becoming cannon fodder for people who did not have their best interests at heart, and realized that they were only safe after they had surrendered. Still, it took an extreme act of will for a child with romantic notions of valor to 'give up' and admit defeat. It was especially difficult because surrendering took away all the shortcuts to prestige and pathways to success that had been laid out for them by everyone they knew. A boy could be taken seriously as a soldier when otherwise he would be just another face in middle school. German WW2. The post says: " Youth ( Join ) in Air defense. " 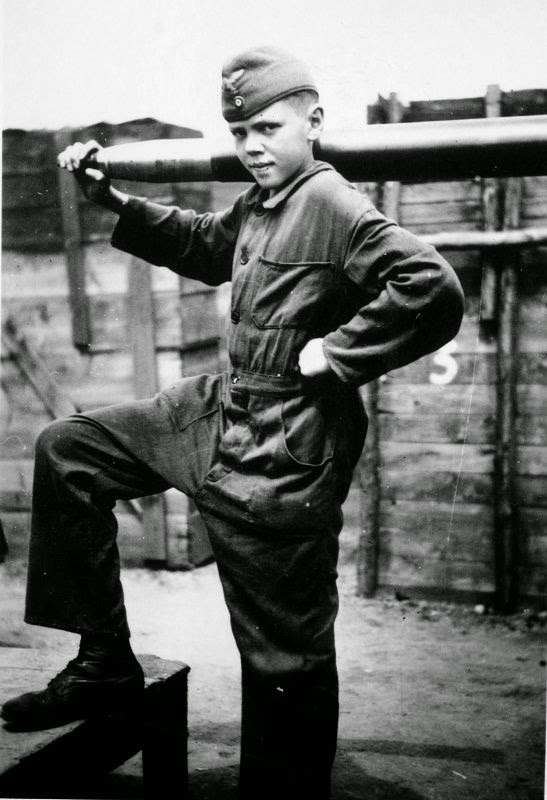 Children manned many anti-aircraft batteries in the major cities, and usually were not asked to do so - they were told to do it as part of their normal routine. 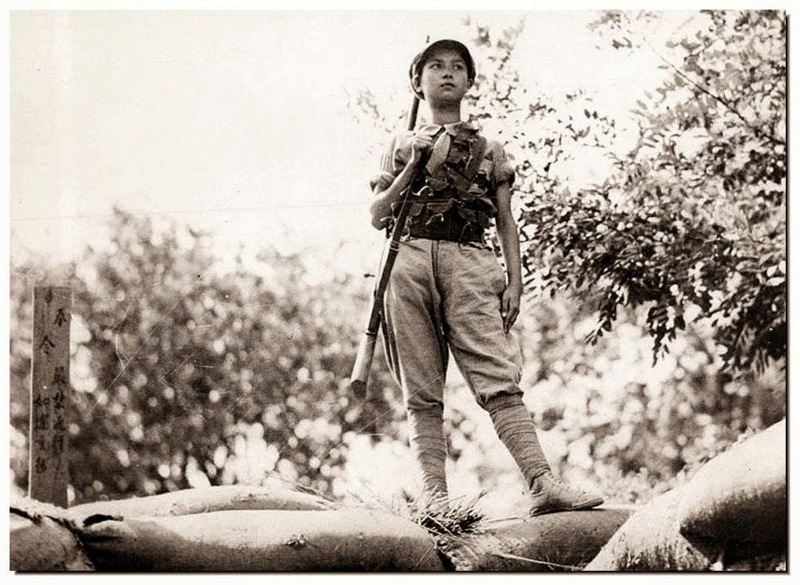 Child soldiers carried guns and fought. They were actively recruited by some combatants. 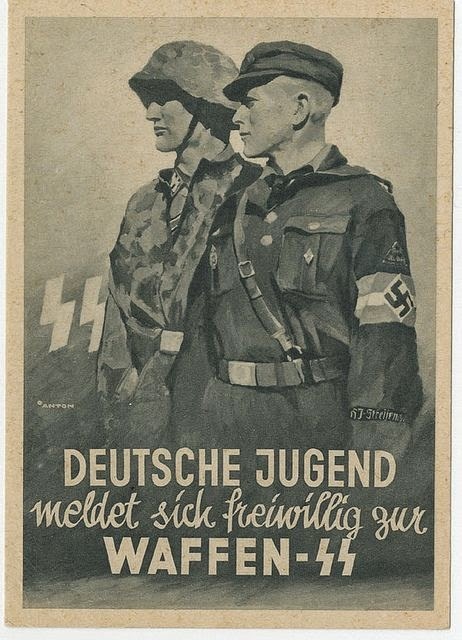 The Germans were the most active in recruiting children for their Hitler Youth active combat formations such as the 12th SS Hitlerjugend Division. 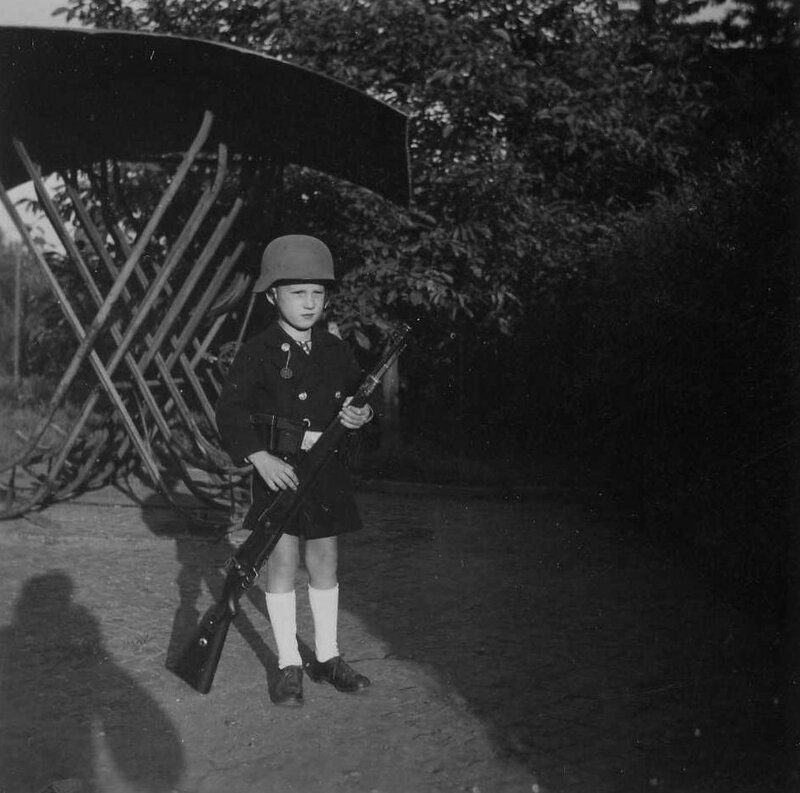 Since most schoolchildren were already manning anti-aircraft guns or performing other civil defense duties (spotlights, patrols), it was not quite as much of a leap in Germany to actually enlist as it would have been for children elsewhere. 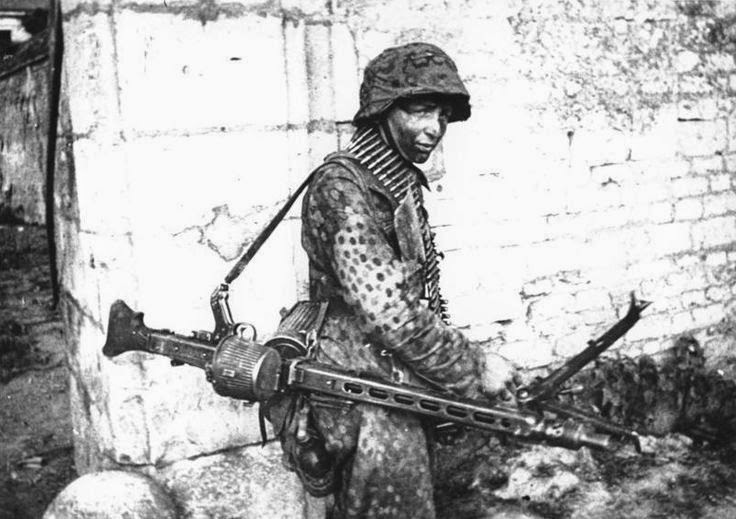 By late 1944, the Wehrmacht was taking anyone that could carry a rifle. Children, of course, didn't know any better and were not ready to make adult choices. While from our perspective they fought for the enemy, it's possible for many to feel sympathy for them. The peer pressure on them and their lack of perspective doomed them to joining up and dying for nothing. Berlin 1945 (Ang, Federal Archives). 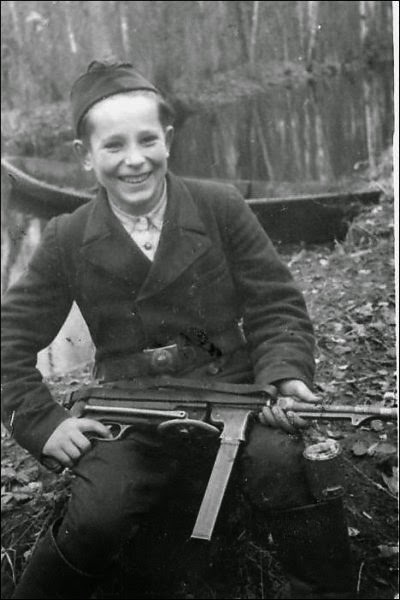 It was heinous of their elders to think that was appropriate for boys of 10, 11, 12 years of age to carry a gun or ride in a tank. A huge fraction of them wound up dying or being maimed for life. 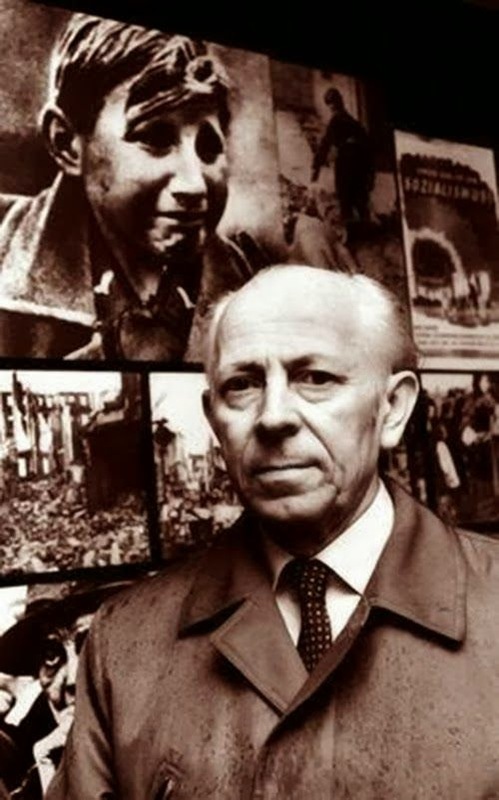 This lad, Hans-Georg Henke, believed that he had lost everything when the war was lost because he knew of nothing else. He went on to a great life, but he had no way of knowing that could happen. 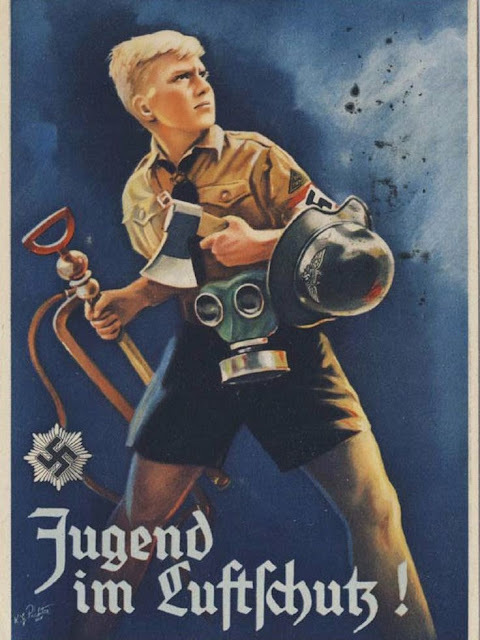 Many know of the famous Hitler Youth, led by Baldur von Schirach, and their SS Division. 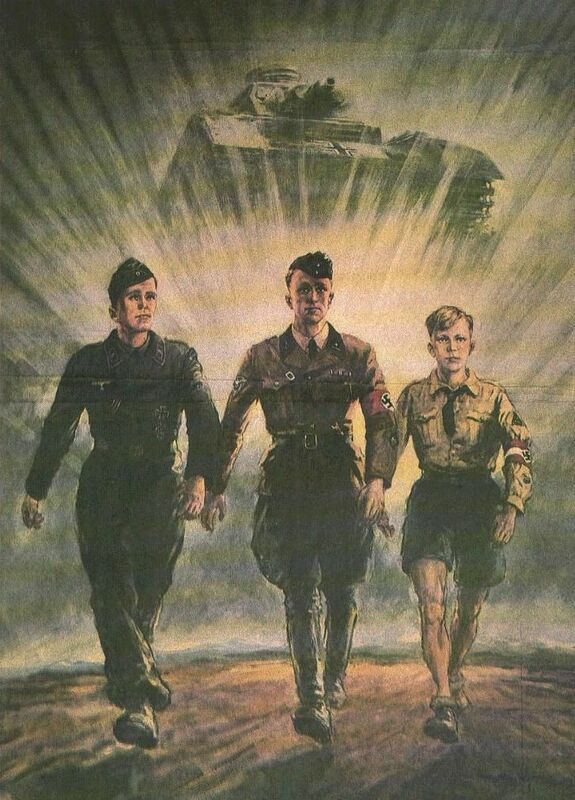 The 12th SS Panzer Division "Hitler Jugend" Hitler Youth Division saved the entire Western Front for Hitler and Rundstedt in August 1944 after the US breakout from Avranches. 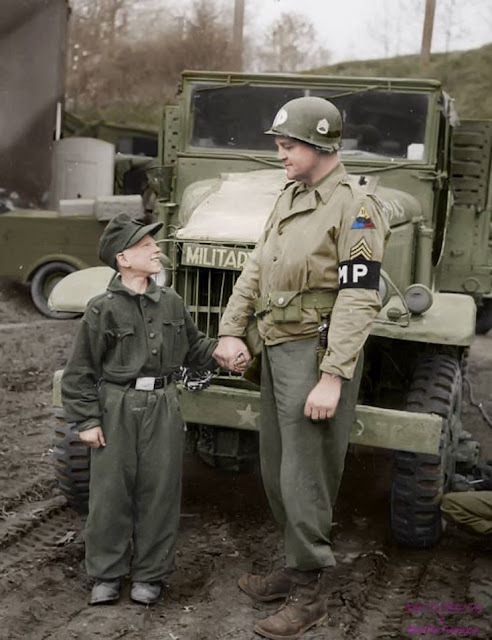 They prevented the British and Canadians from closing the northern escape route for the German armies fleeing from out of the Mortain pocket, preserving the so-called Falaise gap despite ferocious Commonwealth efforts to close it. Without their efforts, the German defense of the West would have entirely collapsed in 1944. Only a very small fraction of the boys survived, and those that did kept fighting for the remainder of the conflict. 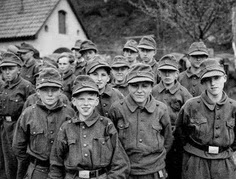 Hitler Youth were some of the last defenders of Berlin. Yes, they were fanatics, because they didn't know any better. 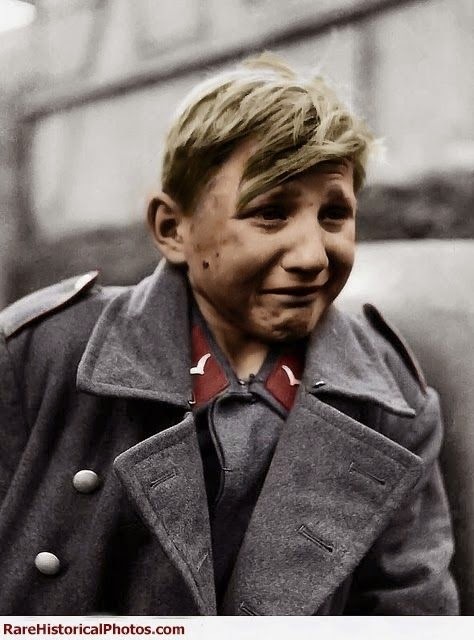 Here he is, Hans-Georg Henke - the 16-year-old German soldier crying - recently. However, focusing just on the Hitler Youth is misleading. 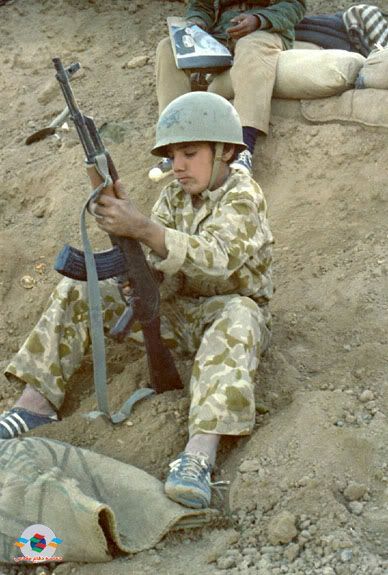 There were children serving on both sides of the conflict, in all armies. 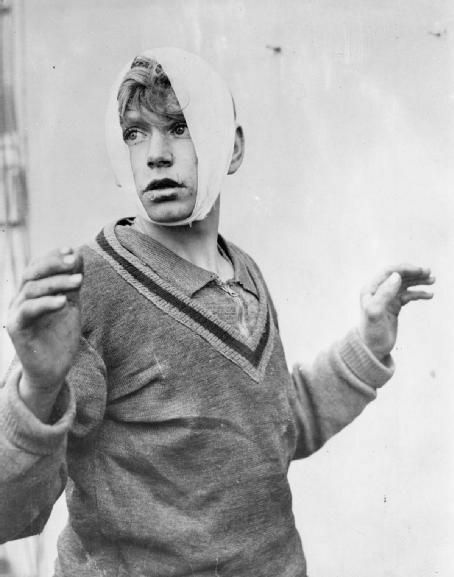 Wounded son of the regiment. 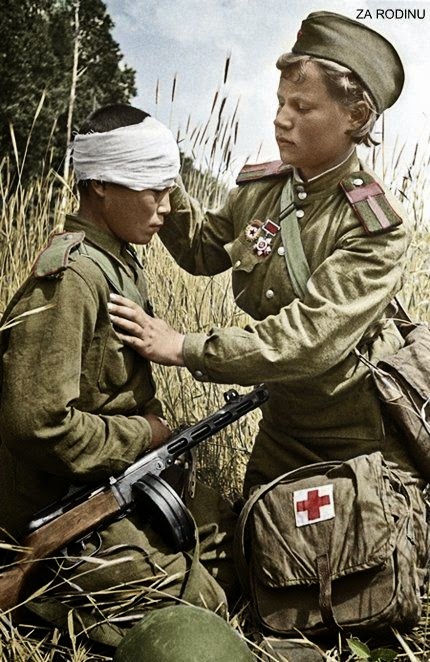 Wounded Russian, child soldier, is patched up by a child medic in the field. Among other things, notice how casually the submachine gun is placed (for propaganda purposes of course) and how the nurse doesn't seem to mind it pointing at her. Try to imagine that happening now. 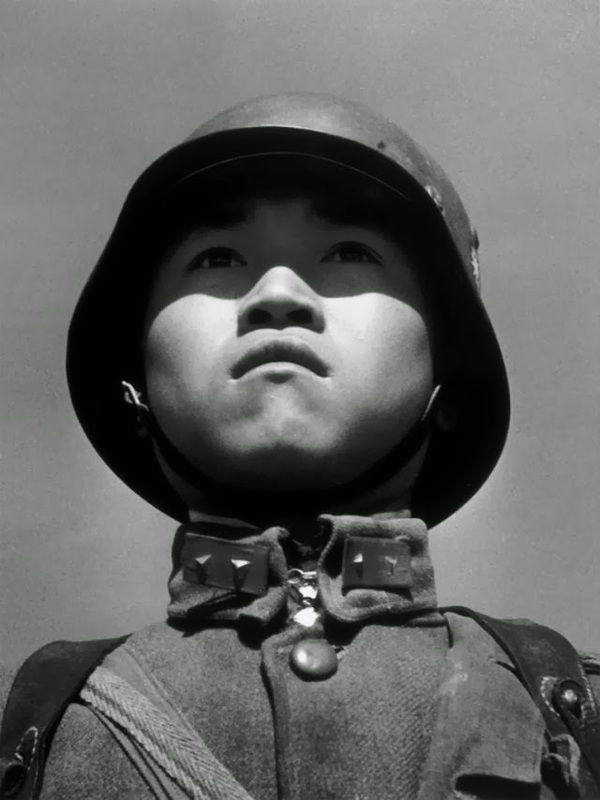 The Chinese had many boys holding rifles, while the Soviets enlisted them as partisans and spies. Some underage kids snuck into the US and British armed forces. 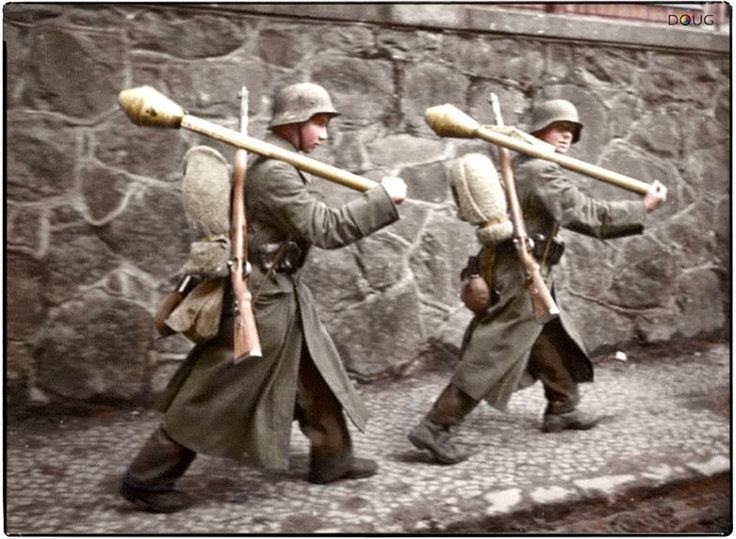 No, these are not actual soldiers, and this is not comparable to kids carrying actual guns and shooting and being shot. However, indoctrination begins early, and kids are very impressionable. Original caption: 'New York, New York: Soldiers In Miniature. Decked out in military uniforms featured at the 40th annual Toy Fair, Salvatore Beniti, left, and Craig Smith, both stand at attention before a picture of their hero, General Douglas MacArthur.' Toys, dolls, play uniforms, and picture books took the military forces as their theme, with virtually every bit of war equipment duplicated in miniature. The US and British Army and Navy recruiters weren't being too choosy under the circumstances, with the enlistment personnel not checking too closely for absolute age compliance during the darkest days after Pearl Harbour. While some later proudly proclaimed that they had enlisted at age 17, that was not supposed to happen. Boys also manned anti-aircraft and civil defense positions in Great Britain and Germany, downing bombers and fighting fires. 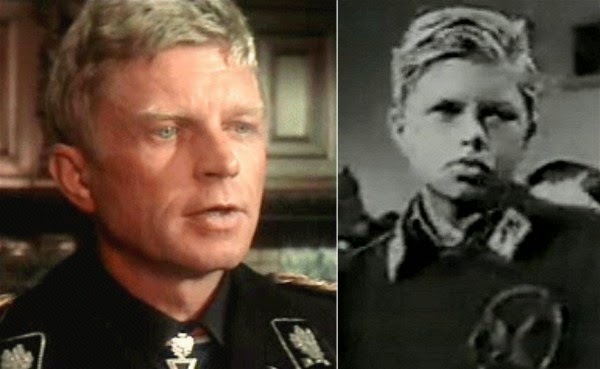 Hardy Krüger was studying acting, but boys in Germany weren't allowed to be choosy and ignore the war. He wound up in an SS Division as a 16-year-old. 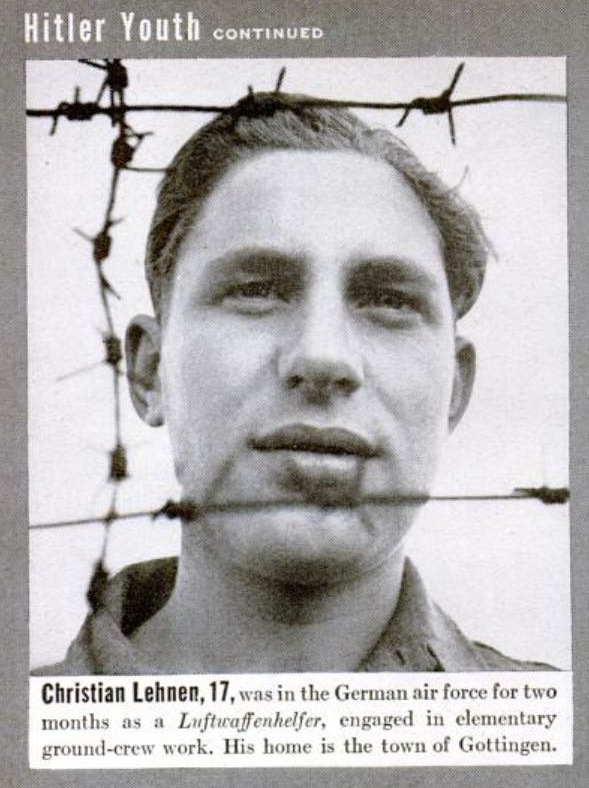 Of course, he survived the war and became a famous actor, but he was playing the part for real in the ruins of Berlin. Oh, Hardy is very much still with us as of 2018. It is incorrect to state that the desire to use children as soldiers was monolithic or even tolerated by everyone in the German high command. 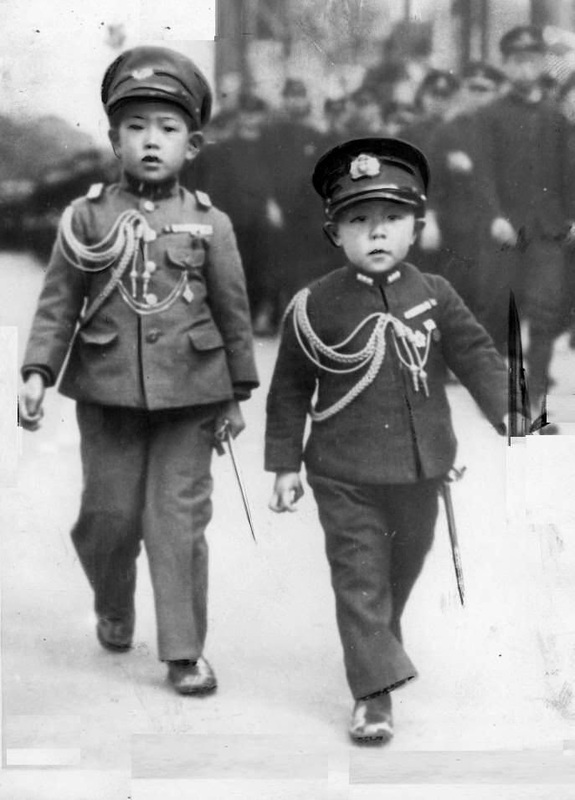 Even in the closing days of the war, many thought that using children to fight was barbaric. However, the children were recruited and fought anyway. 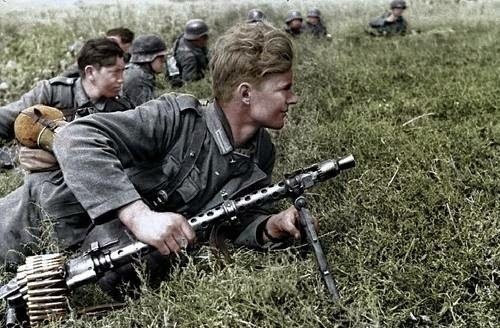 During the Battle of Berlin, for instance, German national leader (Reichsjugendführer) of the Hitler Youth (Hitlerjugend) Artur Axmann and his child soldiers formed a major part of the last line of the German defense. 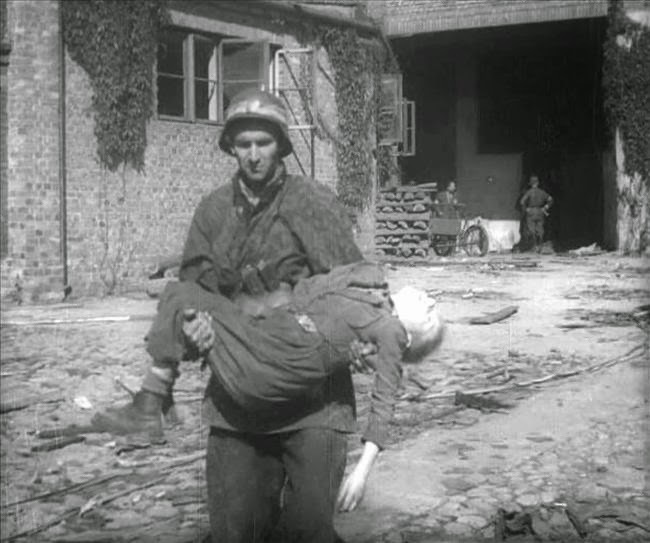 As in Normandy, the children were reportedly among the fiercest fighters. Kids don't have a developed moral conscience, so they make excellent killers when people who do have such consciousness tell them to kill. The Berlin city commander, General Helmuth Weidling, ordered Axmann to disband the Hitler Youth combat formations as the Soviets closed in. Unfortunately, in the confusion, Weidling's order was never carried out. 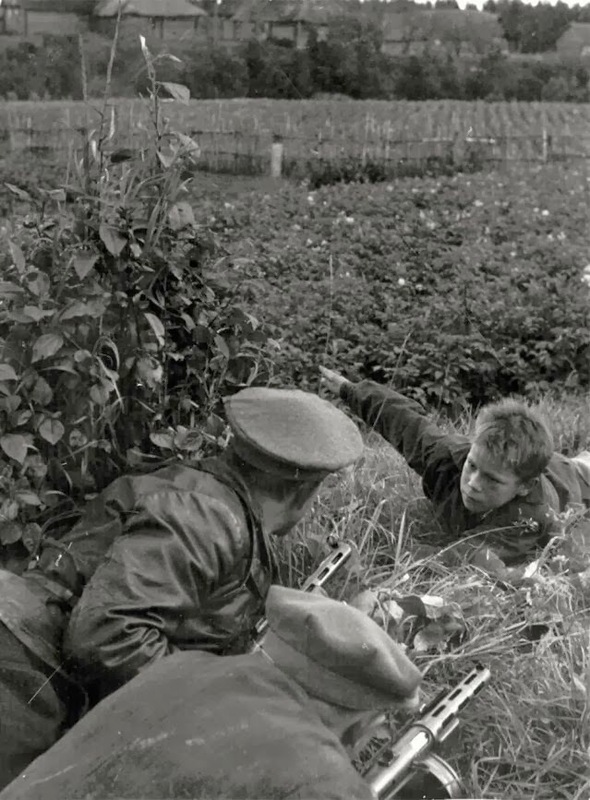 The remnants of the youth brigade took heavy casualties from the advancing Russian forces: only two survived. Axmann? He died of old age in Berlin in 1996. 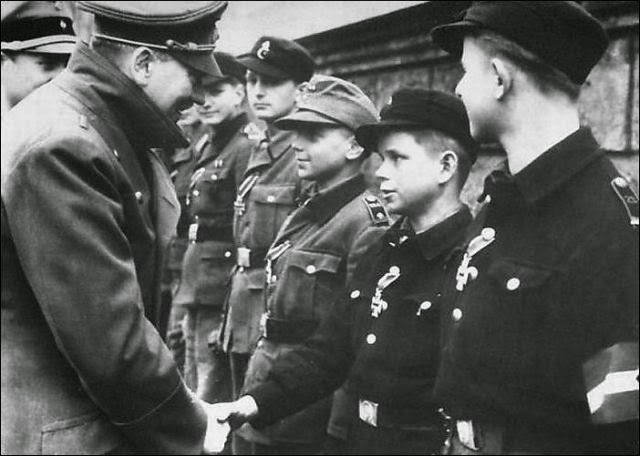 Hitler Youth being awarded medals, 1943. That's a touch more realistic than the usual propaganda shots (Federal Archive). Children can fight and die when their elders choose to let them. Those that did should be remembered. They were just kids. 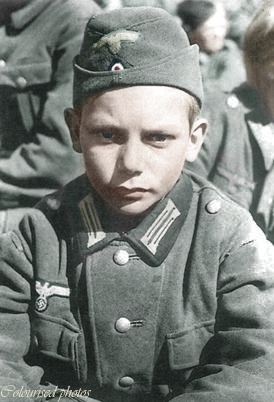 11-year-old "soldier" killed during the Warsaw uprising in 1944. Really, what can you say about such a horrible scene. 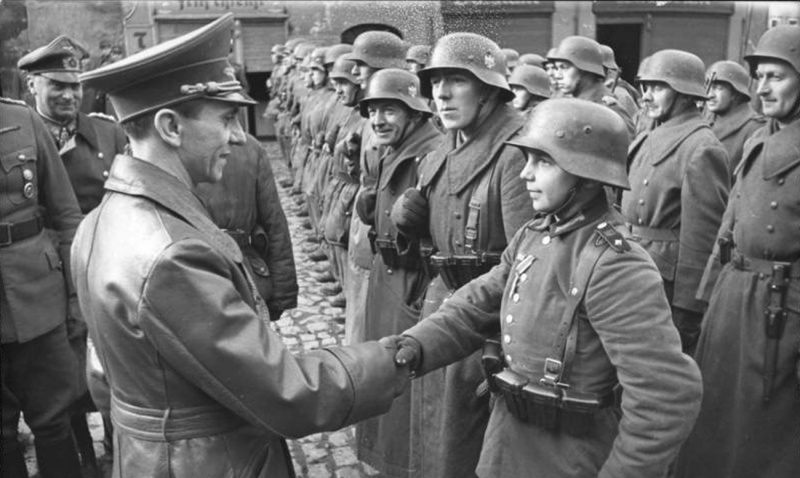 1944 - Ten-year-old German boy soldier poses with his Major after their capture in Antwerp, Belgium. Hundreds of other prisoners taken with them march past in the background. 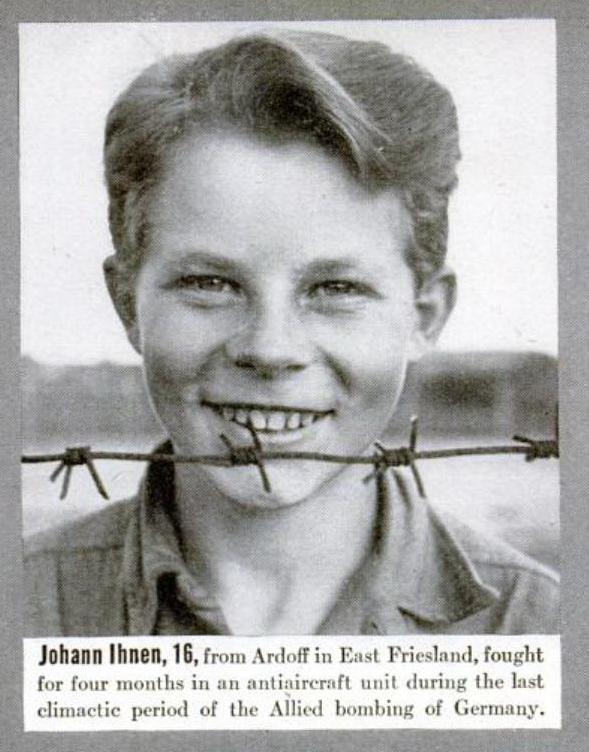 Since Antwerp was in Allied hands by October 1944, this is proof that child soldiers were serving well before the Reich's last days. 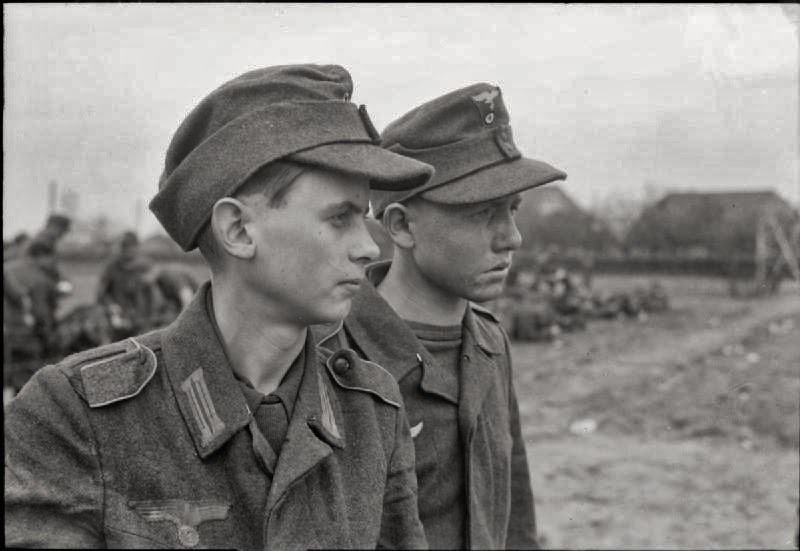 German youth in uniform surrender to Allied troops in Belgium. New Years, 1945. 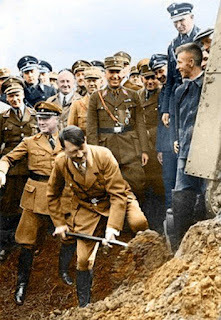 They knew nothing but the Third Reich and no doubt felt it could never end. 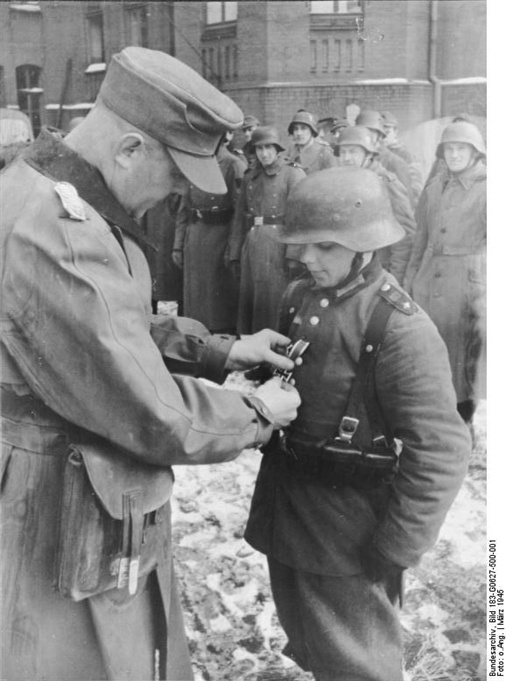 A 12-year old Hitler Youth leader receives the Iron Cross, Second Class for combat performance, March 1945. The Iron Cross meant he did... something. The Last of the last in defense of Hitler and the Third Reich. 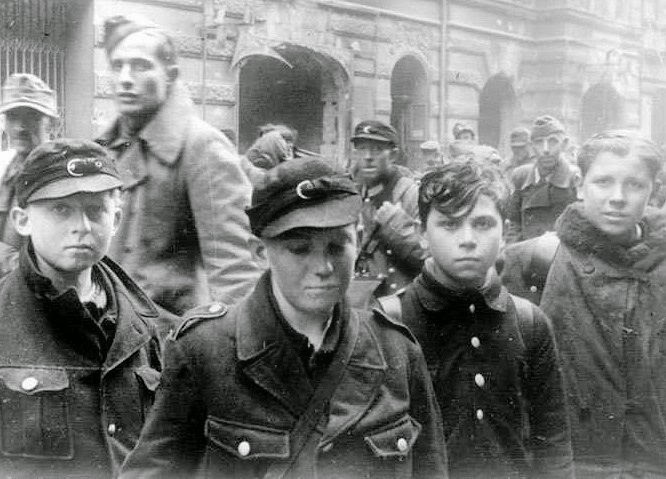 Child "soldiers" caught during the Battle of Berlin, April-May 1945. Most of them were ordered to ditch the uniform and go home. Behind them appears to be a column of their elders headed toward a processing center, these boys must have been pulled out. 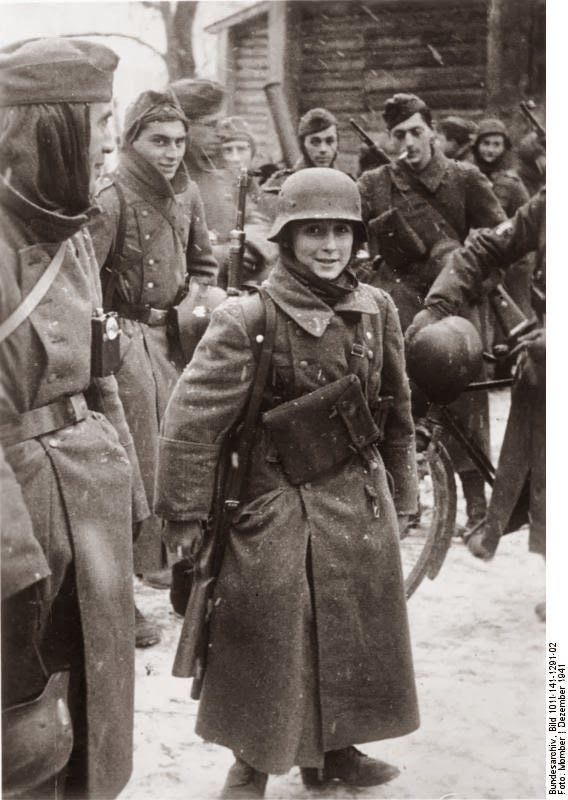 Teenage German soldier, who served with the Hitlerjugend division, is taken prisoner by US troops near Forbach (Alsace), March 1945. 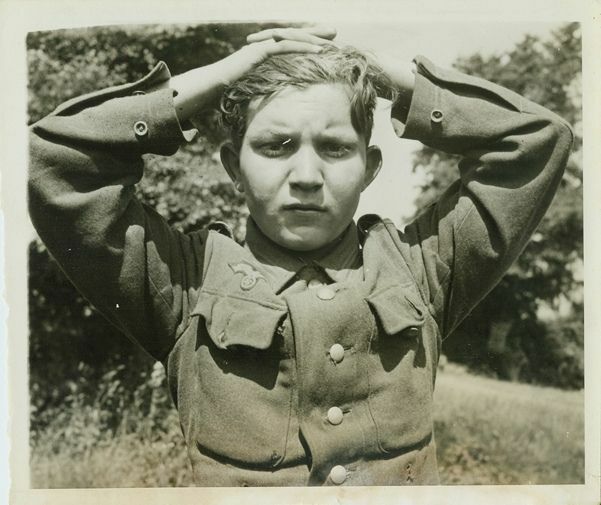 A 13-year-old POW from a Hitler Youth unit captured by the US Army in Martinszell-Waltenhofen, May 1945. 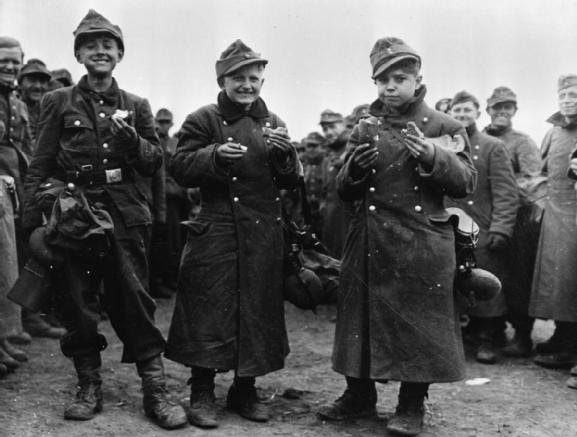 Three 14 year-old German prisoners of war eating rations in front of a group of other POWs, 29 March 1945. 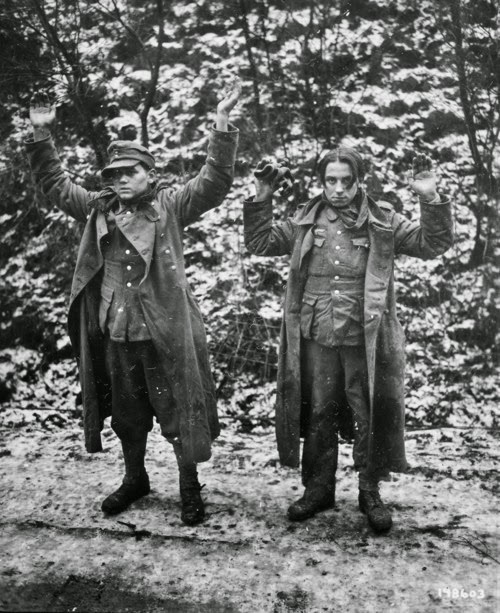 The boys were captured by 6th Armoured Division, Third US Army, near Frankfurt-am-Main. 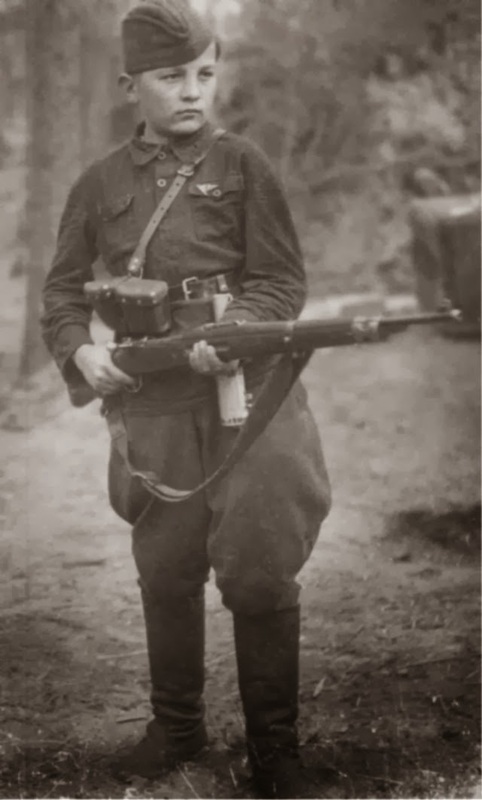 13-year-old Soviet Partisan. Nice uniform - too nice. Obvious propaganda shot. 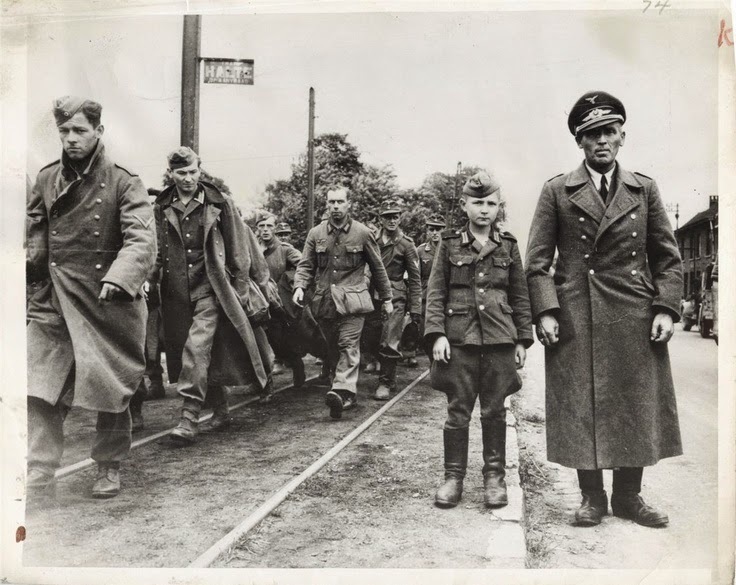 World War II - Prisoners of war - 42-35302875 - Rights Managed - Stock Photo - Corbis. 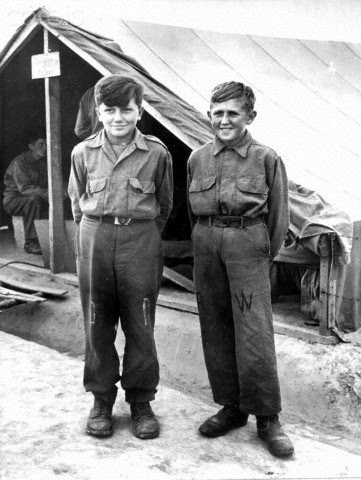 Adolescent German prisoners of war - almost children - in an American prison camp shortly after the end of World War II. 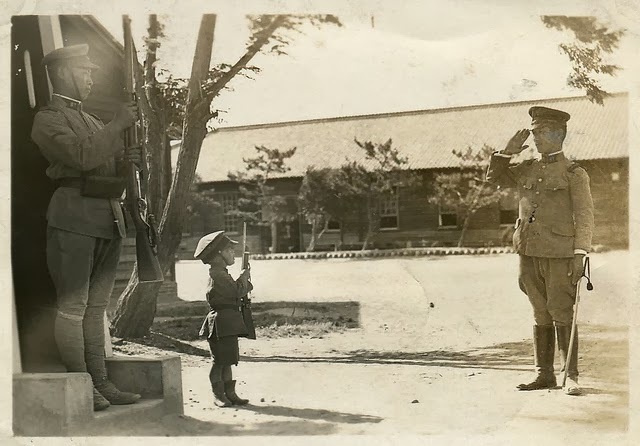 A Japanese soldier-to-be. They indoctrinated them early. Kids love to play war. A Son of the Regiment wearing Red Star. These sort of mascots fought and died. 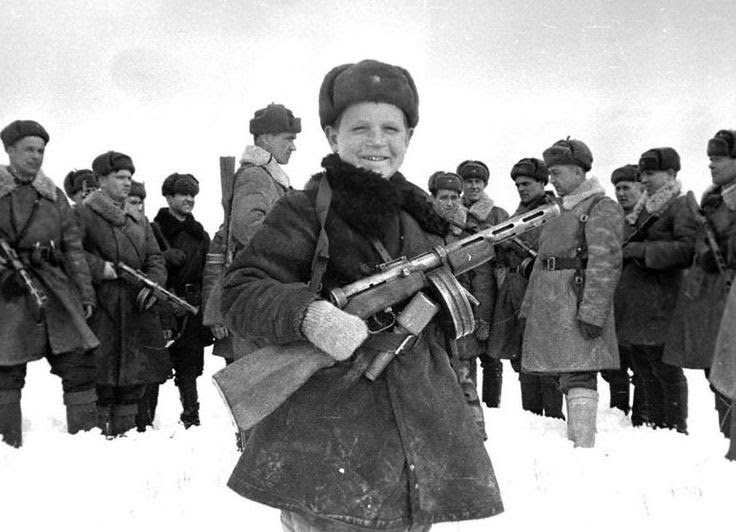 Boy Red Army soldier serving with front line unit, 1942. 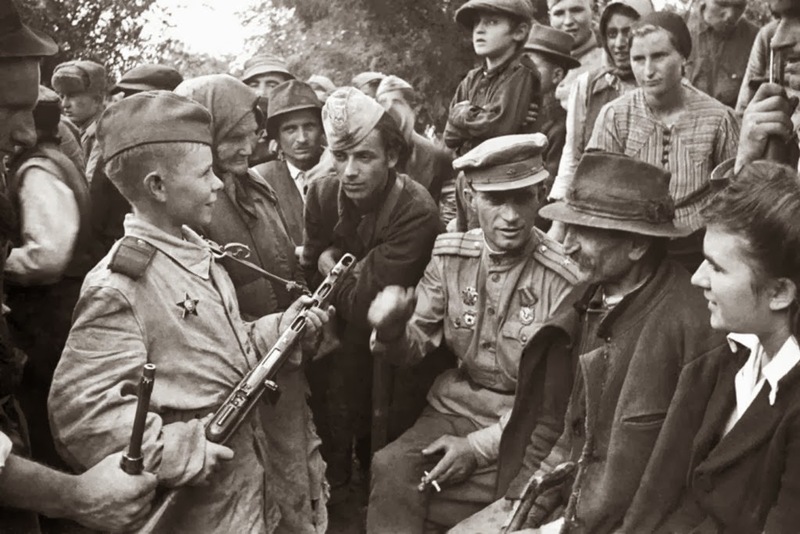 The presence of children as young as 12 in Soviet army units was routine. They all received the same weapons and kit as adult soldiers, slightly adjusted for size. 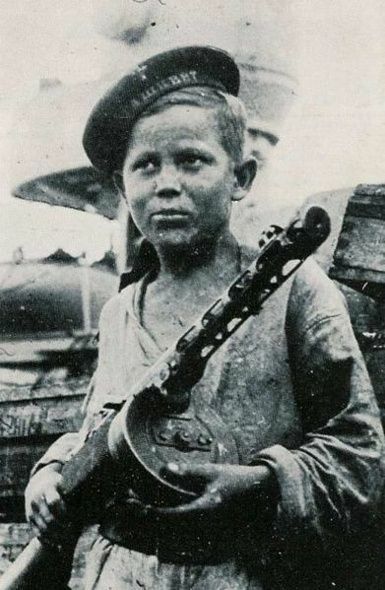 This boy is carrying the standard issue PpsH SMG and anti-personnel grenades. His war-fighting abilities remain a mystery, but an artillery shell or bomb will kill him just as surely as the others. 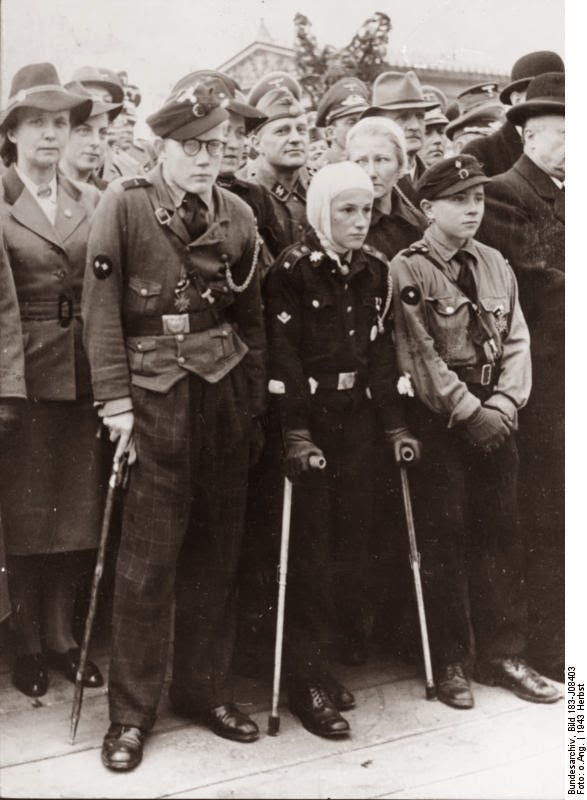 A wounded German Hitler Youth. It's all fun and games until somebody loses an eye. 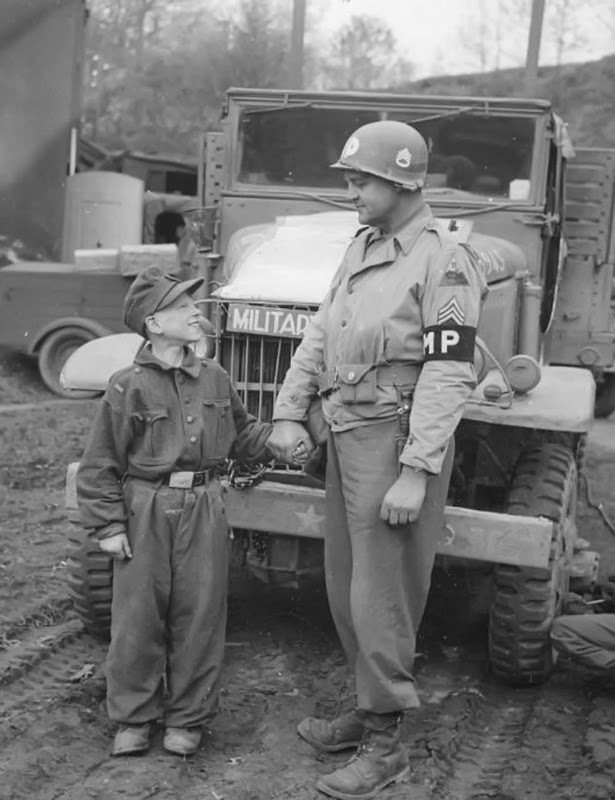 Young scout reports to the commander of the partisan detachment G.V. Gvozdev about the location of the Germans. Undoubtedly a propaganda shot, but accurate. 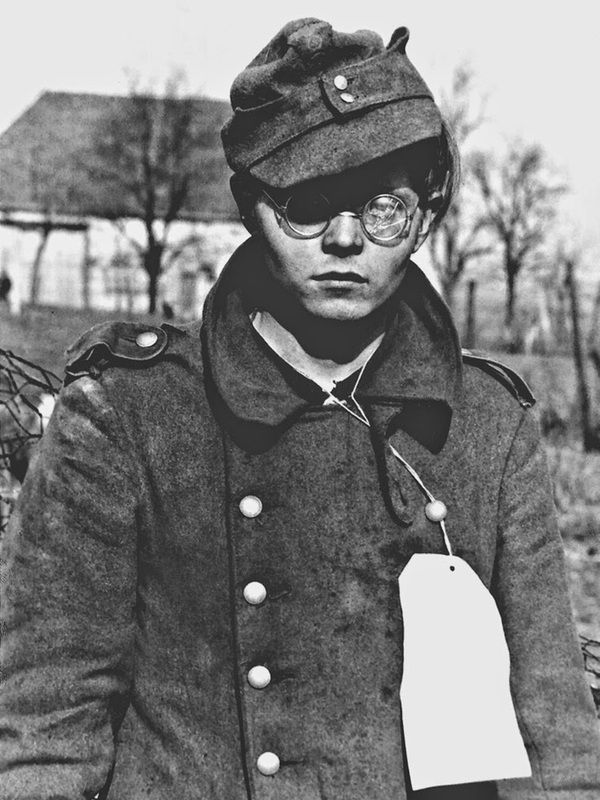 A young German wounded prisoner of war captured by the First US Army in Simmerath, Germany. December 1944. People were horrified at the time, too. 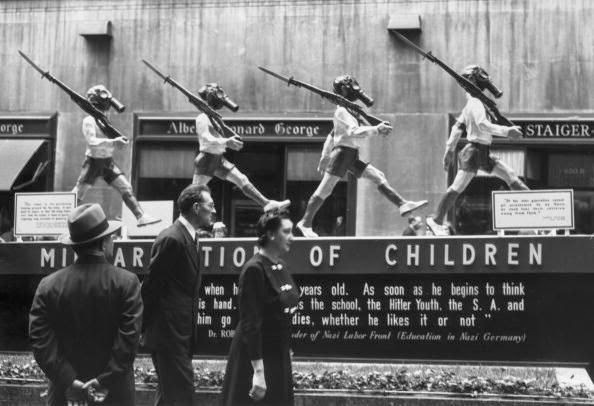 This is circa 1945: people view a display entitled of "Militarization of Children" with statues of young boys wearing shorts, armbands, gas masks and carrying rifles, Rockefeller Center, New York City. (Photo by Anthony Potter Collection/Getty Images). 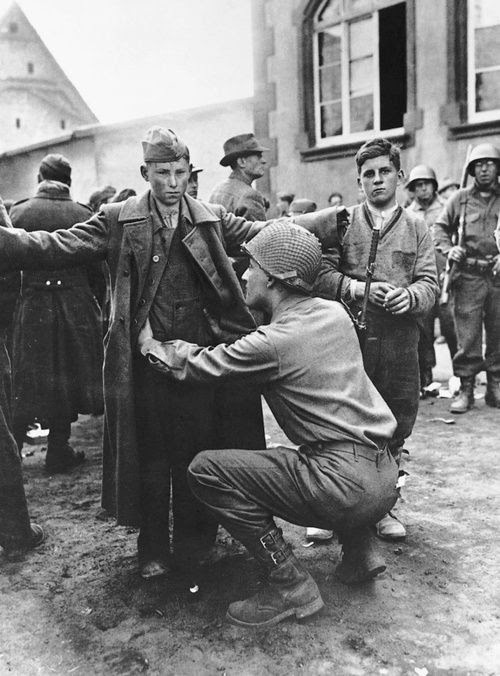 Hitler Youth members pressed into army service are caught by the Americans. 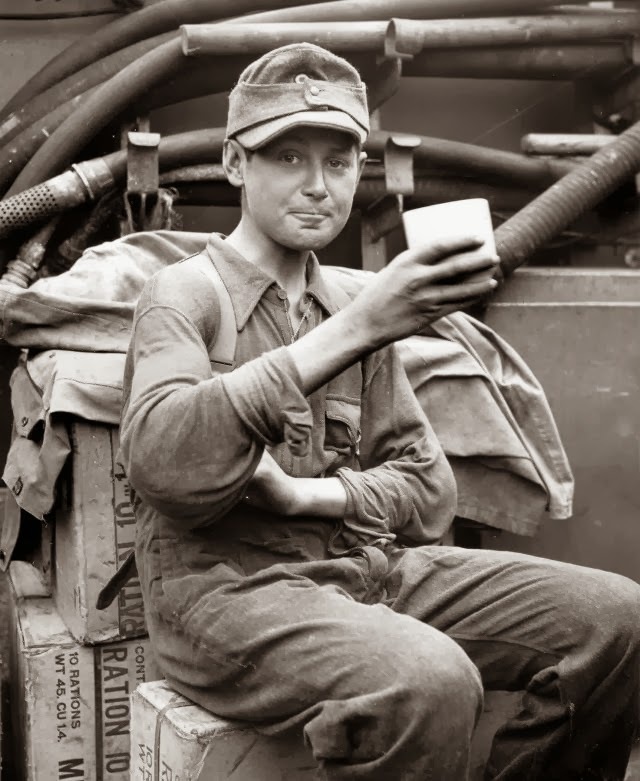 Any such youth over 15 was treated as regular soldier for POW purposes. 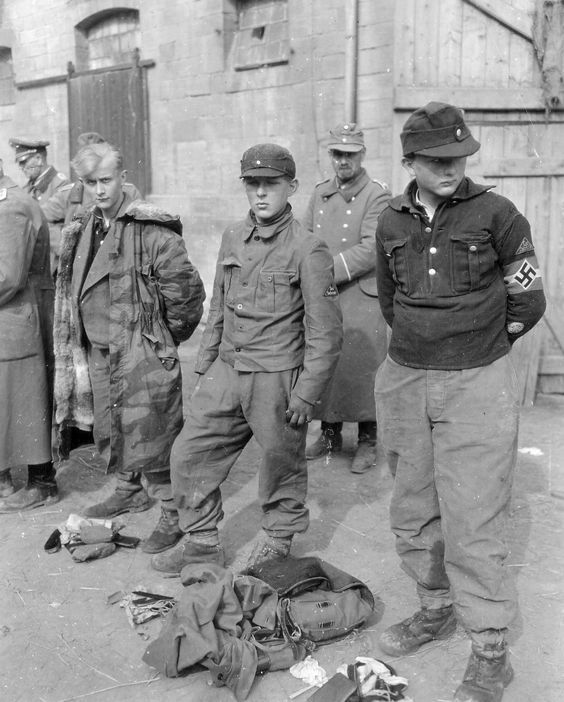 Note the blond guy wearing a winter Waffen SS coat usually issued to officers only. Sheer speculation, but he may have gotten it from a dead comrade. 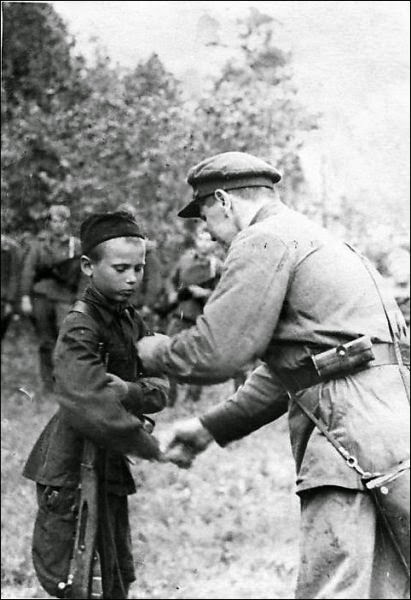 The kid appears to be receiving a medal, see picture below. A propaganda photo that went disastrously wrong, it appears to be a partisan unit. 16-year-old Wilhelm Hübner proudly accepts the Iron Cross Second Class from Joseph Goebbels. 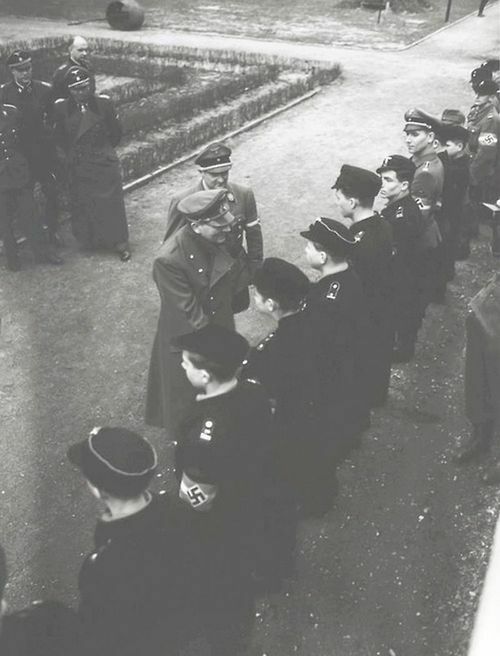 Roughly a month before he committed suicide, Hitler holds his last awards ceremony in the garden of the chancellery. The recipients are all Hitler Youth members. 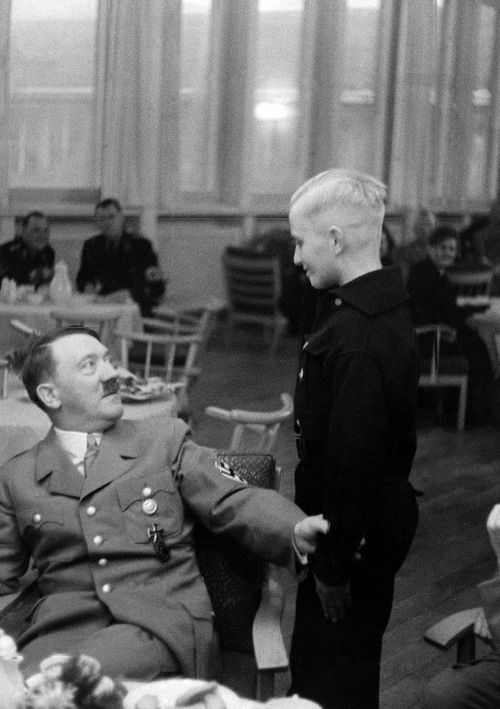 Hitler is shaking the hand of 12-year old Alfred Czech - the boy's name alone is ironic. 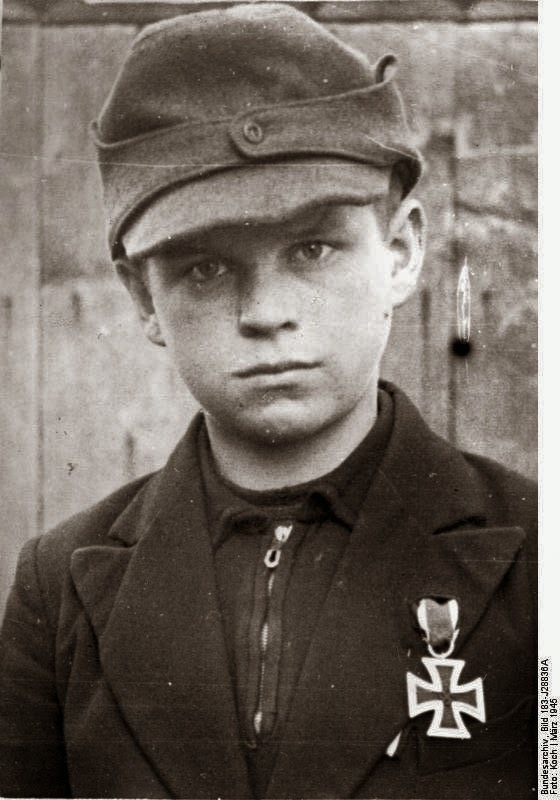 To the latter's right is 16-year old Wilhelm Hubner, already a photo star thanks to receiving a medal from Goebbels in a previous ceremony (see photo above). Both Czech and Hubner have been awarded the Iron Cross 2nd Class, quite a lowly medal for Hitler to award personally, but times had changed. If any one of them survived and could time-travel back to that moment, they'd likely have whipped out their pistol and shot him dead. Lest anyone think that these pictures are heroic and the lads are enjoying every moment of their glory, here is one last photo that shows the reality - not the false hype and glamour - of war for children. It was against US policy to induct anyone under the age of 18. However, a few did sneak in. Well, more than a few. Many of them bragged about it in later years, but at the time, if they had let on about their true age, they would have been dishonorably discharged like the fellow below. Calvin Graham was an extreme case. 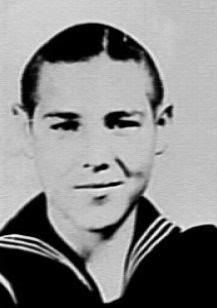 He was only 12 years old when he lied to get into the U.S. Navy. He wasn't found out until he was wounded at Guadalcanal. He was dishonorably discharged, but his benefits were restored eventually. The British routinely sent children into harm's way. Oh no, you protest, this is just propaganda now! 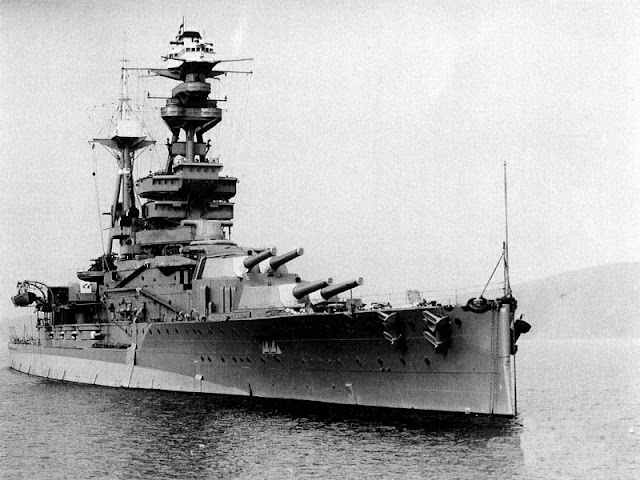 Actually, over 120 child sailors aged 15 and 16 died on the Royal Navy battleship HMS Royal Oak on 14 October 1939, and they weren't the only such children to perish. It was standard practice in the Royal Navy to embark such kids (officially called Boy Seamen) on warships as a sort of apprentice program. This was intended to create future leaders in the Royal Navy. When German submarine U-47 under the command of Guenther Prien torpedoed and sank the Royal Oak on 14 October 1939, these children perished in the same proportion as their elders. The incident created such a scandal that the Royal Navy was forced to in essence eliminate the program (against First Lord of the Admiralty Winston Churchill's strong opposition, mind you). But, you know how it is, wink wink, nudge nudge, a lot of boys still got on warships. The last living survivor of the Royal Oak, Arthur Smith, was a 17-year-old Boy, First Class (yes, that was his official title) when Royal Oak sank. He passed away on 11 December 2016 after giving interviews in which he admitted to still being haunted by the screams of dying men. The Royal Oak took over 120 boys to their deaths in October 1939. Oh, and for those who made it this far and perhaps think that this is merely a quaint historical topic that really has no bearing on the current world, the same thing goes on today. 'it is sad cause they struggling and try to worry about their self but can't cause people wanna control over them kids." What's for dinner? Cause I'm hungry for that SNICKERS MY BOISSSSSSS!